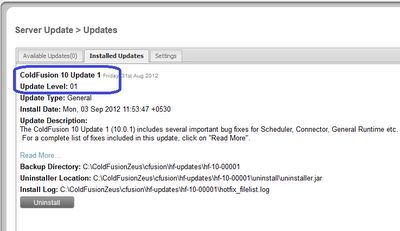 ColdFusion 10 featured a Hotfix Notification and auto-installation facility from ColdFusion administrator. mistakenly applying the HotFixes to wrong versions of ColdFusion. This can be the trouble shoot reference for any kind of Hotfix installations. This guide covers all the Hotfix related information and also contains updates to initial release. This eases the hassle of manually applying, misplacing the Hotfix files, or mistakenly applying the HotFixes to wrong versions of ColdFusion. The HotFix installer is an executable jar file. Since ColdFusion runs on Java runtime, there is only one Hotfix installer for all platforms. In the description below (in Q & A format), wherever it is mentioned as “ColdFusion Home’ it means Home Installation Directory of ColdFusion. similarly ColdFusion Instance Root is assumed as C:ColdFusion10cfusion. For Multi Instance case, Instance Root is assumed as: C:ColdFusion10cfusion1. To which versions of ColdFusion this Hotfix can be applied? Hotfix feature is there only for ColdFusion version 10 and it is not applicable to earlier versions of ColdFusion. Login to the ColdFusion Server’s administrator. Then on the left hand side panel at the bottom you can see “SERVER UPDATE” link . On Expanding it, you can see Updates link. Once you can click on that, in the page that it opens has three tabs. “Available Updates”, “Installed Updates” and “Settings”. Note:If you are opening it for first time configure the fields that you require under Settings tab. However, don’t change the Update Site/Site URL as this is the URL that Hotfix information is pulled from unless you are setting up your own local site (explained below). “Available Updates” tab lists all the available Updates/Hotfixes. Download and Install -> This will download and then installs the Hotfix. Download -> This will just download the file. This is useful if you are planning to install the Hotfix from command prompt in GUI or Console mode or even Silent mode using script. Where is my download file located? If you are applying the Hotfix from default instance it is downloaded at: C:ColdFusion10cfusionhf-updateshotfix_001.jar. Do I need to Start/Stop Server for before applying the HotFix? No. You just need to login to ColdFusion Administrator. And then use the Download and Install option which then stops the servers and then applies the Hotfix. Your server will be automatically started in few moments. Once you login again you can see that installed Hotfix is listed under Installed Updates tab and Available Updates doesn’t show any update as it is installed. Does it take care of Multi server instance Start/Stop automatically? Yes. Hotfix installer will automatically stop, applies Hotfix, and starts back all the servers that you have selected to apply the Hotfix. In case of multi instance how can I optimize the process for applying the Hotfix to all instances? In this case, you can login to the default ColdFusion instance’s (cfusion) Administrator and apply the Hotfix to all the child instances that you have created (after installation using instance manager). Do I have to uninstall Update 1/Hotfix 1 to apply Update 2? No. You don’t have to uninstall any previously applied Hotfix to install any latest Hotfix (i.e higher numbered Update). When I clicked on the Install button nothing seems to happen. How to confirm whether installation is progressing or not? There seems to be a bug in ColdFusion Administrator wherein on click of Download and Install button, download happens but Installation doesn’t start. In case of windows, java.exe process should be running (from the TaskManager window) . If above mentioned (Windows/Unix platforms) processes are not running, you can re-click the Install button again to start installing. In what case Installation or Uninstallation can hang? All efforts are taken to ensure that it doesn’t happen. However, external factors can be the cause for this in System’s environment. As soon as Hotfix installation is started, stopping the sever(s) first is the core thing that must happen before Hotfix files are applied on the server(s). Same is the case for un-installation also. Unless this is done, nothing will proceed. If the server is in a state where it can’t be stopped, installation/un-installation could be hanging to stop the server state. Example:- Ports 8007 onwards are used to shutdown the ColdFusion server(s). Say for some reason if these ports are occupied by some other service or server (Not related to CF), then ColdFusion server can’t be stopped using commands unless you kill the process. Steps to follow here are: Installer/Uninstaller should be killed and then kill the server that couldn’t stopped and then again do Install or Uninstall. Are there any User privileges that I need to have before applying the Hotfix from ColdFusion Administrator? If you are applying the Hotfix from ColdFusion Administrator, your ColdFusion server is running now and should have been started only with appropriate start/stop privileges as required. Hotfix installer will start running with the same privileges and Start/Stop of servers during Hotfix applying process should happen in the background automatically. When the server is started using /bin/coldfusion script, it starts the server with the RUNTIME USER that is mentioned in the coldfusion start/stop script. The default user that is shown while installing ColdFusion is nobody. If you have any other user while installing, server will be running as that user. The same rule is followed when you apply the Hotfix from Administrator. It will re-start the server with the same user as it was running with which makes your server secure. i.e., if your server was running as nobody before applying the Hotfix, even after applying the Hotfix from ColdFusion Administrator, it will start the ColdFusion server with the same ‘nobody’ user only. On very few of *INX based OSes when machine console’s buffer allocation size is almost zero, server start might not be proper even though grep command would say ColdFusion is running but actually ColdFusion Administrator can’t be accessed. All other Hotfix operations like Stopping the server and then applying the Hotfix should have been successful except this ‘Start Server’ operation which happens after applying the Hotfix. To workaround this, you have to stop the server which was improperly started manually and restart it once the Hotfix applying process is completed. Unless it is the case for your machine, you can ignore this note generally. Is there any User privileges that I need to have before applying the Hotfix from command prompt? You should have opened the command prompt with privileges that are sufficient to Start/Stop the ColdFusion Windows Services. In other words, it is equivalent to saying -> open the command prompt with Run as Administrator option in Windows Vista to latest Windows Editions and as Admin user in other Windows platforms and then run the Hotfix jar. Installer will let you know if enough privileges are there or not when you try to invoke JAR installer from command prompt. You should have opened the terminal and switched to privileges that are required to Start/Stop the ColdFusion server. Installer itself will prevent if you don’t have enough privileges. It is equivalent to saying that if you are a sudo user, go ahead and execute the installation. To do this, you are not required to be a root user. How to apply the Hotfix in case of ColdFusion deployment to App Server/JEE Server? You have to install it from command prompt. There is no option to install it from ColdFusion Administrator. However, Available updates and Installed updates can be seen in the ColdFusion Administrator. First, you have to download the Hotfix from ColdFusion Administrator’s Server Updates section. Since installing Hotfix on J2Ee server is a manual process, you have to stop the ColdFusion instance first from your JEE application server. The just downloaded Hotfix installer file will be located at:<CFHome>cfusion.warWEB-INFcfusionhf-updates. This will open the installer which will guide you through the installation of Hotfix. Note: While invoking the installer from command prompt, make sure to use the 32-bit jre for 32-bit ColdFusion and 64-bit jre for 64-bit ColdFusion installations. Beware that if you don’t follow this, if the Hotfix contains platform specific DLL files then the installed ones would be the bit reverse of what is actually desired. Once the installation is done you have to start ColdFusion server instance from your application server. To avoid confusion I would just say that you should cd to the directory wherever Hotfix installer jar (Ex:- hotfix_001.jar) is downloaded and then invoke the installation from command prompt. When should just the Download option in Administrator be used compulsorily? 1) If you want to run the Hotfix Installer from command prompt by using the following mentioned command whenever you wish to install later in GUI or Console mode so that one can see the progress of the installation in the UI/Console. 2) This is a mandatory step for applying Hotfix to JEE CF instance. 3) If you want to apply the Hotfix using your organizations customary methods. Details on how to get it worked with customary methods is explained later. In case of JEE deployment, should even the base application server be stopped apart from ColdFusion instance before applying the Hotfix? It is good to stop the Base application server (WebSphere) before applying the Hotfix. Unless any ColdFusion files are locked by the base application server even after ColdFusion instances are stopped this is not mandatory. Can Hotfix be applied to both Exploded and Unexploded EAR/WAR ColdFusion JEE deployments? You can apply Hotfix using the above said command prompt installer only to the exploded ear/war deployments. For applying the Hotfix to unexploded ear, you have to first explode it and then apply it using the command prompt installer. Once you apply it, you have to create a EAR/WAR file and then deploy it back. For Standalone and Multi instances, how the servers are started? If service is there for the ColdFusion that you have applied Hotfix, it will start the service. If the service is not there for the ColdFusion instance, then it starts ColdFusion instance in the background. It always starts the servers in the background. How to know the delta of changes that are applied by the Hotfix installer? Any modified/added/removed files are listed in the file named: hotfix_filelist.log under the above directory. And the installation log with the name Adobe_ColdFusion_10_Update_1***.log is also under the same directory. What should be done if I get the error Signature verification failed while trying to install? There should have been error while downloading the Hotfix. Try re-downloading it again and then install it. You wouldn’t have applied the mandatory Update which has to be applied to the server by manually applying the Update from the command prompt. 1. 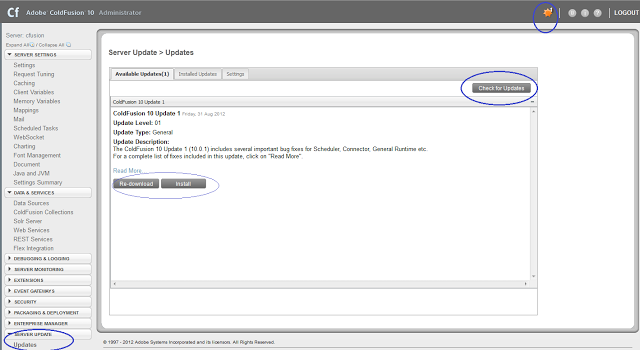 Download the Updater manually from the above URL and place the Update JAR file in a directory. Give full path of the file cf10_mdt_updt.jar depending on where it is downloaded. What should be done if the install application launches but splash screen the progress bar does not move while installing the mandatory update? In the above command, you should use the path of the jar file that you have downloaded. What should be done if I get the error checksum verification failed while trying to download? There could be browser cache of the updates xml file. When there is modification to the updates file (refresh of the build), your browser might still be verifying the install jar’s checksum with cached updates file that lists the checksum. As a workaround, do Ctrl+F5 to clear cache in your browser and then click on ‘Check for Updates’. And now, if you try to Download and Install, it will all be fine. When I clicked on “Check for Updates” Button no Updates are shown and it says that No updates were found why? One is if your ColdFusion server is behind a proxy. Other one is your ColdFusion server is behind firewall. On how to circumvent these two are explained below. What can be done if the ColdFusion server is behind a proxy server and can’t access the Adobe’s Update site URL? If the ColdFusion server is behind a proxy, specify the proxy settings for the server to get the update notification and download the updates. Proxy settings can be specified using the below-mentioned system properties in the jvm.config (<ColdFusion_Home>cfusionbinjvm.config) in case of stand-alone installation or corresponding script file for JEE installation. What can be done if the ColdFusion server is behind the firewall and can’t access the Adobe’s Update site URL? In this case, you have the option to set up your own local site. From a machine where you can access the site (http://www.adobe.com/go/coldfusion-updates/), what you have to do is first download the file http://download.adobe.com/pub/adobe/coldfusion/xml/updates.xml from your browser (Open it and use “Save Page as” option). And then download the file http://download.adobe.com/pub/adobe/coldfusion/hotfix_001.jar from your browser. Important: The following set up is required only on one server. Then open the ColdFusion Administrator for which you want to apply the Hotfix. Then change the Update Site/Site URL “http://www.adobe.com/go/coldfusion-updates/” to your local networks updates.xml path(http://<MachineIP>:<Server Port>/updates/updates.xml). Administrator running within your local network. Whenever Hotfix is released, you will have to update this xml file and place the new Hotfix JAR on your local site. Then verify that whatever you have done is working fine. To do this go to Available Updates under Updates link and click on Check for Updates . It should show you update depending on the Updates that are listed in the updates.xml file. Then try downloading the file by clicking on Download button. Once I click on Install option, how to know what is going on behind the scenes? Administrator first creates the file named hf-10-00001.properties file at the same location as Hotfix jar file. This file is used to invoke the Hotfix installer. Once the installation is started, first thing it does is trying to stop the ColdFusion servers. Then it applies the Hotfix and then restarts all the servers for Standalone and Multi instance installations. If you open your TaskManager window (Choose the option Show processes from all users in the TaskManager) in Windows machine, it will have coldfusion.exe running and if you are running as service then both coldfusion.exe and coldfusionsvc.exe would be there. So, if you have 3 ColdFusion 10 services running then there are total of 6 ColdFusion related processes running. This Hotfix installer stops one server after the other when ‘coldfusion.exe stop’ command is issued to the server. Even this process comes up in the TaskManager. Once the installation is started you can view the processes in the TaskManager. How to know when the Hotfix Installation is completed? Adobe_ColdFusion_10_Update_1_Install***.log that means installation is complete. And if you open the ColdFusion Administrator you should be able to access. Naming convention is same for all higher numbered Hotfixes as well. How to know Hotfix Installation is properly completed/applied or not? There are four things that you should look to determine that Hotfix is properly applied. 1.Under SERVER UPDATE ->Updates->Installed Updates tab the just installed Hotfix Update Level should be shown. If it is Update 1 it should be displayed as 01. 3. Check the log file named Adobe_ColdFusion_10_Update_1***.log under C:ColdFusion10cfusionhf-updateshf-10-00001 and make sure that there are no errors. Yes. It will change. As explained above, under System Information the build number will be updated. Under Version field, the new Update Level field shows the update number. Which HotFixes are shown under Available Updates? Under Available Updates, only the latest (not yet applied) HotFixes are listed. For example, if HotFix update level 10 is applied on the server and now say Hotfix 12 is available and you haven’t applied Update 11, it shows only the Hotfixes whose update level is more than 10. In the Update Installation log if there are errors how to proceed further? 1. Hotfix Installation log is placed at: C:ColdFusion10cfusionhf-updateshf-10-00002Adobe_ColdFusion_10_Update_2_Install*.log depending on the instance you have applied the Hotfix from. If there are errors logged in this file, and if you want to re-run the installer to fix them you have can do the following. After rectifying the root cause (like base app server stop for jee installation if files are locked by base app server), you can uninstall and then install it again or do the following. In the following example is for update 2 change it according to your update. This will make the update level to previous level and so you will be allowed to run the installation again. It is equivalent to updating the updates.xml file by removing the <item> node corresponding to the current Hotfix. 2. If the above trick doesn’t work, you can install the Hotfix from command prompt. In the following example modify the paths according to your Hotfix level. What should be done when Hotfix file is not getting downloaded from ColdFusion Administrator? 2. If this file is existing means hotfix installer is downloaded. http://download.adobe.com/pub/adobe/coldfusion/hotfix_001.jar (Change the Hotfix Jar name according to your Hotfix) and try installing from command prompt. What happens to the Hotfixes that are already applied to Server that are received privately from Adobe Support for a bug when publicly released Hotfix is applied? If the bug fix is included in the publicly released Hotfix, you don’t need to do anything. Hotfix installer itself takes care of all clean-up required. In general, it is always intended to be included. However, for some reason (say, due to timing of release), if the private Bug fix is not included into public Hotfix, you have to apply back the fix manually to your ColdFusion Servers. But this should be a rare case. When the uninstallation is done from Installed Updates of ColdFusion Administrator what is the state of servers? Uninstaller removes the files from all the server instances to whichever it is applied. If you have applied the Hotfix to ColdFusion instances cfusion,cfusion1,cfusion2 at one go, when you invoke uninstallation from any of these instances it will uninstall from all the instances(cfusion,cfusion1,cfusion2). However, backup directory containing the original backed up files is left back for debug/backup purposes. How can uninstallation be done from command prompt? 1) If you have installed from command prompt in Console or UI mode, you can run the following command. First cd to C:ColdFusion10 and then run the following. 3) If you have installed the hotfix using silent installation on your own, uninstallation can also be done silently. Run the folowing command: >C:ColdFusion10jrebinjava -jar optcoldfusion10cfusionhf-updateshf-10-00002uninstalluninstaller.jar Even though you have installed hotfix to 5 instances using a single script, there is only one hotfix uninstaller for all these 5 instances for a given update (Usually this is under cfusion instance. It could be under other instance if cfusion was not opted for HF ). And when you invoke the above command it will uninstall hotfix from all the 5 instances. How does Hotfix backup directory is helpful? It keeps backup of all the files that are modified and removed. Even after un-installation this directory is kept back for any of your debug purposes. This is also helpful when uninstaller doesn’t work due reasons like uninstaller jar itself is corrupted and you still have easy choice to revert the Hotfix applied to previous state. Any Hotfix is cumulative of all the previous Hotfixes. That means say, Update 2 is released and you haven’t applied Update 1 then if you are just applying Update 2 that itself will also contain what was released in Update 1. Does the Hotfix is cumulative even for Security Hotfixes? Yes, it is cumulative and would contain even the previous General Hotfixes also. For which editions of ColdFusion can this feature be used? This feature is available for all editions of ColdFusion whether it is Developer, Enterprise or Standard Edition. When there is Apply Hotfix option in Server Manager AIR application, how this is different? There are many limitations with Server Manager for applying the Hotfixes to servers. Hotfix notification and installation is a fully functional substitute to Server Manager which is very productive and can be applied just by accessing the ColdFusion Administrator. To how many instances can Hotfix be applied at one go? When you access ColdFusion Default Server Instance (cfusion)’s Administrator you can apply the Hotfix to all the child instances of this main instance irrespective of whether they are in cluster or not. Can the Hotfix be applied to some other machine’s remote instance clustered to a server instance on some other machine? No, you can apply the Hotfix to any number of instances of same installation on the same machine from the cfusion server instance’s Administrator, but you cannot apply the Hotfix to any ColdFusion instance on some other machine. You have to access that machine’s default server instances’ ColdFusion administrator to apply the Hotfix to any ColdFusion instance. Can I apply the Hotfix to any instance from child instance? No, you can’t apply. You can apply the Hotfix to any child instance only from default server (cfusion)’s Administrator. However, you can apply to only that child instance from child instance’s ColdFusion Administrator. Note: There was a bug before Update 3 and it is now fixed. The fix is effective only from Update 4 onwards. If update 3 is not applied, it is advised to apply the Hotfix to child instances from the ColdFusion Administrator of default server instance ( cfusion ). What should be done if one wishes to apply the Hotfix only to a particular instance? After downloading the instance you can run them from command prompt and you can choose to apply only for particular instance that you wish. Or as mentioned above one can apply the Hotfix from a child instance’s Administrator. How much time Hotfix installer takes to complete? It is the taken to stop the server(s) + 10-20 seconds to apply the Hotfix depending on the machine’s processor + time taken to start the server(s). In total, it is generally 40 secs to 2 minutes depending on the number instances and speed. When will Hotfix installer takes more time to install the Hotfix? When you are applying the Hotfixes to multi instances at one go, it has to stop all the servers and then only it can proceed. This would take more time. Can the installation be stopped during installation? It is highly recommended that once you start the installation you don’t interrupt as the file operations will only be half-done if you do that. However, you can cancel it during pre-installation. What can be done if Hotfix installation is stopped during installation? You can re-run the installation. If the installer shows that it is already applied then you just copy the file C:ColdFusion10cfusionhf-updateshf-10-00001backuphf-updatesupdates.xml (Change the path according to your current Hotfix level) to C:ColdFusion10cfusionhf-updatesupdates.xml by replacing it and then re-run the installation from ColdFusion Administrator or from command prompt. Will there be Traditional Hotfixes/Manual procedure still available? No. There won’t be any traditional Hotfixes and manual steps required with ColdFusion 10 onwards. What all kinds of files does Hotfix include? How do I know whether Hotfix Installation/Uninstallation has started once Install/uninstall is invoked from ColdFusion Administrator? And for Unix/Linux platforms you can use ps -ef | grep hf to find out. Other indications are server stopped in few moments and is restarted after sometime. Are there any manual steps to be performed after applying the Hotfix? Unless any specific Hotfix needs any extra step there are no further steps required. Let us say for Update 1, you are required to re-run the connector for external Web servers. Say if you haven’t applied the Update 1 and you are directly applying the Update 2, you will have to do it after applying the Update 2. -> Rerun(Remove and add back) the connector for external Web servers. What if an Organization has other customary methods to apply/automate Hotfixes and wants only the Hotfix files that are Modified/Added/Deleted to be applied? If your organization has Scripts/Other Methods rather than applying from ColdFusion Administrator or from GUI/Console Installation and wants only the Hotfix files that are Added/Modified/Deleted, you can do that as well. Step 1: Using your own customary scripts, first of all, you always will have to clear all the files under CF Instancelibupdates from all your server instances. Step 2: Then get the modified and added file list (of Hotfix). This will put up the files under a location that you would have selected while installing. In this example I have selected the path as C:CF10_HF1_Files while installing. Combine the steps 1 and 2 in your scripts and move these wherever you want them to be moved by replacing the target files with always file-overwrite option. If there are any changes for JVM.config file or to some of configuration XML files which has the chance of being modified by end customers themselves, those files are not laid out as said above. For Update 1 there are no such changes. So, for now no worries. If we don’t happen to update this blog, then you can figure out this info yourself by installing the Hotfix to ColdFusion Server and checking the jvm.config and xml file modifications from the hotfix_filelist.log file. Depending on your requirements sometimes even silent installation could also be useful. After downloading the Hotfix from ColdFusion Administrator you can use that Hotfix installer jar file for silent installation on your own also. Create a properties file and fill up with the following key/values depending on your installation. INSTANCE_LIST value can be a list of comma separated server instances that are created under a particular ColdFusion installation. #COMMAND_INSTALL applies only to *INX based systems. The parameter COMMAND_INSTALL=true makes sure that the server is started as ColdFusion runtime user(default is nobody) rather the root user. So, make sure to pass this param in Unix/Mac/Solaris machines. And the key INSTANCE_LIST is NOT required at all for JEE. You are ready to run the silent installation now. 32-bit ColdFusion and 64-bit jre for 64-bit ColdFusion installations. 2. Stopping and restarting the servers should be taken care by you. cd to the directory containing hotfix_001.jar in your command prompt and run the following command. Note: There are no other extra manual steps required here unless a specific Hotfix requires some extra steps. Including Server Start/Stop every behaviour is same as if you are applying the Hotfix from ColdFusion Administrator. So, start/stop is also automatically taken care. I am attempting to install ColdFusion 10 onto my Windows 10 64-bit machine. when I run the 64-bit installation (ColdFusion_10_WWEJ_win64.exe) I get the following message: “Invocation of this Java Application has caused an InvocationTargetException.” When I attempt to install the 32-bit version (ColdFusion_10_WWEJ_win32.exe) I get “Installer User Interface Mode Not Support”. I’ve downloaded the CF Mandatory Update (cf10_mdt_updt.jar), but everything I’ve read assumes that CF is already installed and that this is an applied update. I’m just trying to get CF 10 installed on my Windows 10 machine. Can you please help and advise? Thanks in advance. @Charlie, thank you! I backed up the files before deleting. Thank you for the additional information as well, I will take your recommendation. I have all the old hotfix folders in the hf-update folder. Can I delete the old since each HF is cumulative? Readers, if you may have read this previously with IE, note that there was a problem in the underlying HTML which had caused it to be cut off at about 30% of the total content. You’ll want to consider coming back to read it again, and spread the word to any others you may have pointed to it, if they may have been on IE. There were 1 other blog entries with the same problem (https://coldfusion.adobe.com/post.cfm/coldfusion-10-docs-link), and Adobe has now fixed that as well. 4) Type the administrator password and follow the prompts. Same here… I was not able to successfully install the 10-6 update using the install button in the CF administrator on Windows XP. This is my local development machine and using the Developer’s version of CF on it. Just a side note. I was not able to successfully install the 10-6 update using the install button in the CF administrator on Windows 2008 R2 Standard. My hunch was that it was permissions related. . . So to get around it I launched a command window as administrator, cd’d to the hotfix directory and ran java -jar . Great to see this posted here, so that it might get more notice. For those not aware, this is actually an entry that Krishna had posted on his own site in September (http://www.krishnap.com/2012/09/coldfusion-10-hotfix-update-installer.html), and while an entry here then pointed to it, I suspect many missed it. And some may prefer to see such info offered “formally” as it now is here. I would make one suggestion, though: I think it would be wise if the title here did mention “10” in it, as it’s not at all relevant to CF9 users, and they’d have to start reading it to know that. This just may save a little time for some readers. Otherwise, great to see this reprised.